WORKING OUT Outdoors The views in Paris provide ample distraction to any exercise routine, but they also help make the experience even more rewarding. Residing in the 6th arrondissement of bustling Saint Germain des Prés, the Jardin du Luxembourg is Paris’ second largest public park and a haven for fitness fanatics. Commissioned in the early 1600s, it’s here that Parisian morning runs and afternoon sweat sessions are at a premium. For an equally atmospheric path, hit the pavement on the banks of the Seine as far as your body will allow, or for the challenge of steeper slopes, the Parc de Buttes Chaumont’s five kilometers of trails in the 19th arrondissement kick up the level of intensity a notch…or three. Indoors Rasa Yoga Rive Gauche 21 rue Saint Jacques. +33 1 43 54 14 59. rasa-yogarivegauche.com Located in the 5th arrondissement of Paris, the beautifully designed, white Rasa space offers a variety of English-speaking classes from Vinyasa and Hatha to Kundalini. The accompanying spa rewards hard bodywork with soothing holistic treatments. Tip: For Ashtanga, Charley’s your man. For Vinyasa, try Cecile’s class. Hotel Gym Four Seasons George V 31, avenue George V. +33 1 49 52 70 00. fourseasons.com/paris A stay at the George V ranks as otherworldly in a way that few of the world’s hotels can match. The 8,000 square foot gym ups the ante. Weight room, steam room, sauna, pool, as well as an immaculate spa featuring a menu of offerings for men ranging from facials to waxing to anti-hair loss treatments. Located off the lobby of Saint Germain des Pres’ Hotel Pont-Royal, this clubby red and black space is one of Paris’ most enjoyed food destinations. 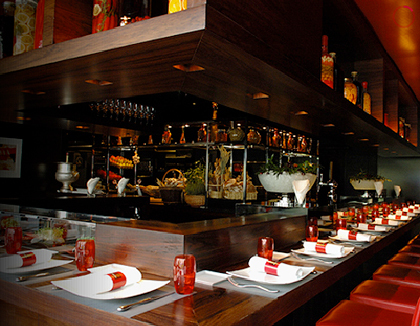 Snag one of the 40-seats at the counter that overlooks the open kitchen, and feast on French culinary master Joël Robuchon’s small-plate creations. Tasting menus and ala carte items are available. Tip: Don’t miss the foie gras or the spaghetti. Le Comptoir 9 Carrefour de l’Odéon. +33 1 43 29 12 05. hotel-paris-relais-saint-germain.com One of the hottest dinner reservations in Paris, Le Comptoir resides in the Hotel Relais Saint Germain’s 6th Arrondissement. The bistro feel of this small restaurant, with daily specials scrawled along a large mirror that enhances the space, draws people in; the food brings them back. Tip: You don’t need a reservation for lunch or at the prime sidewalk tables. L’Evasion 7 Saint Augustin +33 1 45 22 66 20. restaurant-levasion.com This rustic bistro in the 8th Arrondisement has a chalkboard menu and a laid-back vibe. Don’t be fooled; the dishes coming out of the kitchen are some of the best in Paris under young chef Christophe Cavallo’s direction. Traditional dishes like the roasted lamb are sure bets, and the Paris Brest is a must for dessert. Looking for an over-the-top French club like no other? 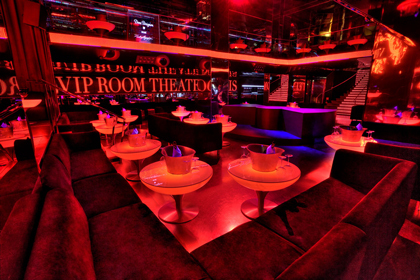 Aptly named Paris hot spot VIP Room is a veritable den of beauties from rising starlets to models to French girl- next-door types. Make no mistake: you need to know someone who knows someone to get in, but with outposts in places like St. Tropez, Cannes, St. Barth, and London, you can be sure of a truly exclusive experience. Sir Winston 5 rue de Presbourg. +33 1 40 67 17 37 The oldest pub in Paris, redone in a dark wood, and named for Winston Churchill, Sir Winston is a chic lounge in the 16th Arrondissement, just off the Arc de Triomphe. Part Asian-part English in décor, the upstairs space, filled with comfortable couches serves food as well as cocktails, while the downstairs speakeasy spins DJ sounds into the wee hours. Literary ghosts inhabit the 26 rooms at this charming boutique hotel where each room represents a letter of the alphabet dedicated to a writer. Outfitted in earth tones with amenities like iPads, free Wi-Fi and plasma TVs, this cozy spot in the central 8th arrondissement might just inspire you to expand your library to include greats like Proust, Kafka, James, or racy Flaubert. 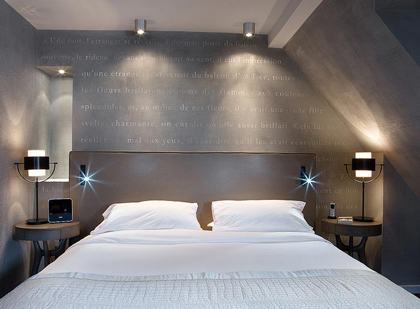 The most sought-after room, Diderot, overlooks the Eiffel Tower. Shangri-La 10, avenue d’Lena. +33 1 53 67 19 98. shangri-la.com The opulent former resident of Prince Roland Bonaparte, Napoleon’s grand-nephew, the Shangri-La is the latest palace property to christen the Seine’s glittery shores. Perched directly across from the Eiffel Tower in the 16th arrondissement, with most rooms offering breathtaking views, the dedication to both modern day service and historic design details is incomparable. Three restaurants, a gorgeous bar, and a brand-new spa and swimming pool make this the Parisian address of note.